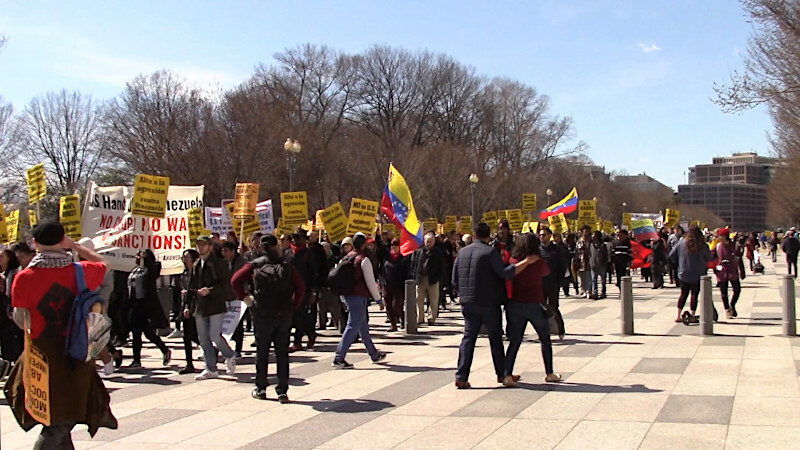 On the 16th of March, protesters marched from the White House to Trump Hotel and finally the Inter-American Development Bank, opposing US intervention in Venezuala. A much smaller group of counterprotesters siding with Venezuala's rival, US backed, self-declared, fake "president" Juan Guaidó also showed up. There were some arguments at the very start, then police separated the two groups. There was no fighting or violence at all. 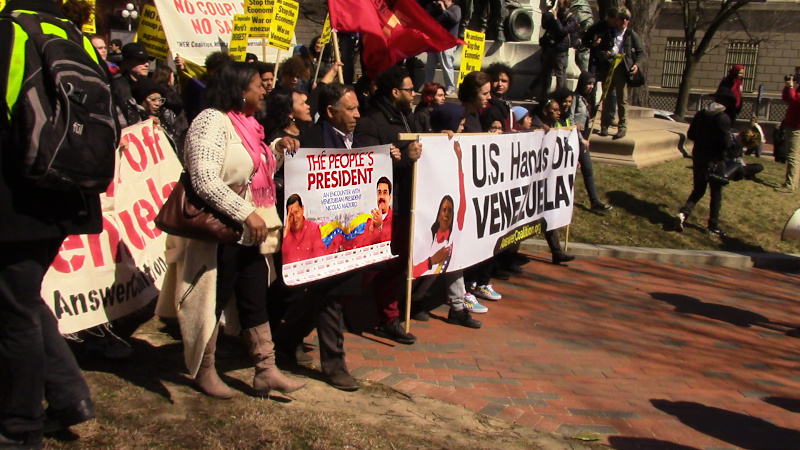 Protesters opposing US intervention were well aware that a street fight in front of the White House between two rival groups of Venezualans and their backers would play right into Trump's hands. Such an event would boost the claim of "civil war" in Venezuala, so it's a bit of a surprise the cops were not withdrawn. Certainly their presence to keep the two sides apart was light, including a couple horse cops, a few feet of waist-high portable fence and a few more cops than usually present. It looked symbolic though, and probably would not have been capable of stopping either group from charging into the other's lines had they wanted to. The pro-Guaidó crew would not have been able to dent the anti-intervention protest so they didn't want to fight, and anti-intervention protesters knew better than to play into Trump's hands. 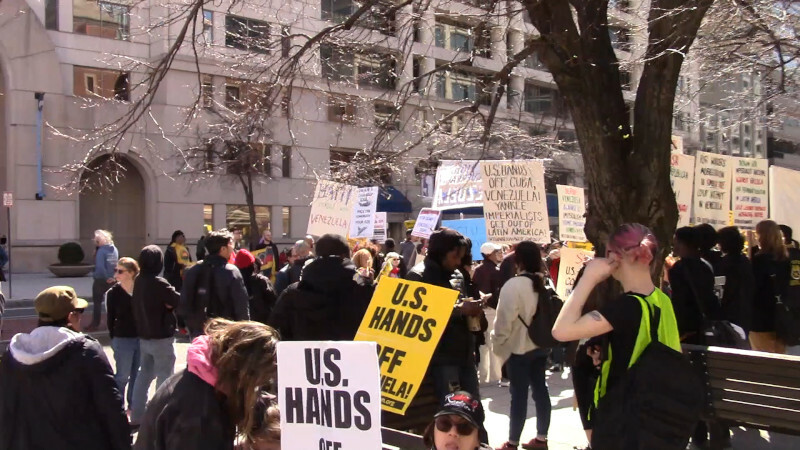 Eventually, the entire anti-intervention protest marched away from the White House, bound for Trump Hotel, the Inter-American Development Bank, and a church across the street from that "bank" where speakers were waiting. The crowd looked way too big to fit in the church. The Trump regime is blaming Maduro for an economic collapse caused by the post-2014 oil price collapse, which in turn was caused by US oil fracking. US sanctions have made matters worse. Now Juan Guaidó has unilaterally tried to declare himself President, the US is openly supporting him, and efforts to finish off Venezuala's economy are in high gear. One of the speakers in front of the White House reported that during the blackout a power station had been bombed by unknown but presumably US backed forces. It is also widely reported that the "aid convoys" carried more than just food, medicine, and other relief supplies. The oil price collapse hit Venezuala very hard. Long before Hugo Chavez the country's economy depended on oil exports, and any one-crop, export based economy is incredibly vulnerable to market crashes. In 2014 US fracked oil production reached a level that worried the Saudis, and they launched a failed effort to kill oil fracking by maxing out their production to crash oil prices. That stopped some of the fracking, but one part of N Dakota was able to produce oil so cheap all the frackers descended on that area, and oil that once sold for $80+ a barrel now sells closer to $40 a barrel. The good thing about this is tar sands is now unprofitable and there is no money to be made with projects like the Keystone XL pipeline. The bad part of it is that Venezuala depended on oil revenue to finance social programs that had taken a huge bite out of poverty, and now that money is gone. 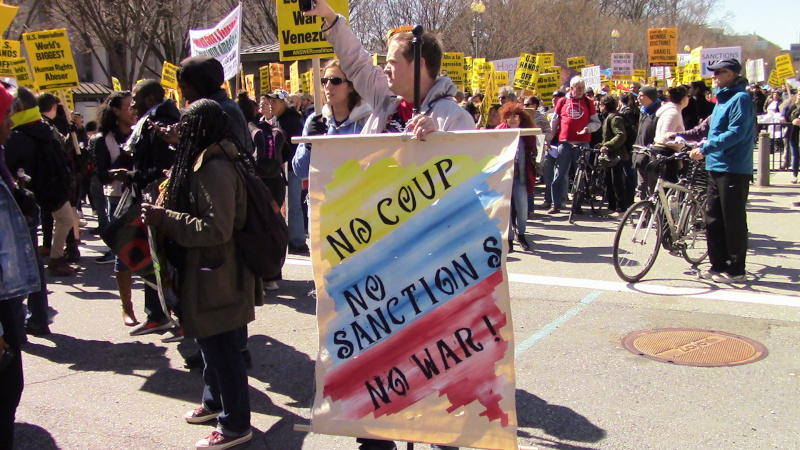 Had the Obama administration overthrown the Venezualan government in say, 2012, no doubt there would be newspaper stories and opposition protests blaming the US backed coup government for the economic collapse, just as the US and current opposition blame Maduro. Certainly Juan Guaidó cannot fix this, as he cannot raise the global price of oil. Even if capitalists chose to exploit Venezuala for sweatshop labor or some other mineral, most of that wealth would leave the country and it would take years for any of it to even be produced at all.